You can chose from Audi A4, Q5, Q7. …and minus $25 with referral code of DDUDARENKO by e-mail, when you will finish your reservation, which marks down price to $42.27 for 2 day-car rent of incredible Audi A4 for 2 days! Or a total of $49 (discount) + $25 (return after finished reservation)=$74. 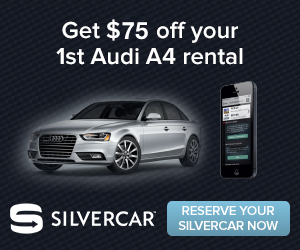 Screenshots — courtesy of Silvercar by Audi.